This expression means that the Virgin Mary conceived the eternal Son in her womb by the power of the Holy Spirit without the cooperation of a man. The angel told her at the Annunciation that “the Holy Spirit will come upon you” (Luke 1:35). 95. “...Born of the Virgin Mary”: Why is Mary truly the Mother of God? Mary is truly the Mother of God because she is the Mother of Jesus (John 2:1, John 19:25). The One who was conceived by the power of the Holy Spirit and became truly her Son is actually the eternal Son of God the Father. He is God himself. 96. What does the “Immaculate Conception” mean? God freely chose Mary from all eternity to be the Mother of his Son. In order to carry out her mission she herself was conceived immaculate. This means that, thanks to the grace of God and in anticipation of the merits of Jesus Christ, Mary was preserved from original sin from the first instant of her conception. 97. 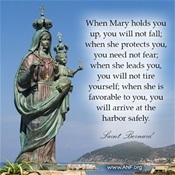 How does Mary cooperate in the divine plan of salvation? By the grace of God Mary was kept free from every personal sin her whole life long. 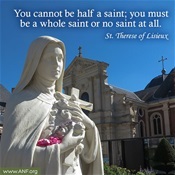 She is the one who is “full of grace” (Luke 1:28), “the all holy”. When the angel announced to her that she would give birth to “the Son of the Most High” (Luke 1:32), she freely gave her consent with “the obedience of faith” (Romans 1:5). Mary thus gave herself entirely to the person and work of her Son Jesus, espousing wholeheartedly the divine will regarding salvation. In the Bible this title regularly designates God as Sovereign. Jesus ascribed this title to himself and revealed his divine sovereignty by his power over nature, over demons, over sin, and over death, above all by his own Resurrection. The first Christian creeds proclaimed that the power, the honour, and the glory that are due to God the Father also belong to Jesus: God “has given him the name which is above every other name” (Philippians 2:9). He is the Lord of the world and of history, the only One to whom we must completely submit our personal freedom. For us men and for our salvation, the Son of God became incarnate in the womb of the Virgin Mary by the power of the Holy Spirit. He did so to reconcile us sinners with God, to have us learn of God’s infinite love, to be our model of holiness and to make us “partakers of the divine nature” (2 Peter 1:4). The Church calls the mystery of the wonderful union of the divine and human natures in the one divine Person of the Word the “Incarnation”. To bring about our salvation the Son of God was made “flesh” (John 1:14) and became truly man. Faith in the Incarnation is a distinctive sign of the Christian faith. 77. What other consequences derive from original sin? In consequence of original sin human nature, without being totally corrupted, is wounded in its natural powers. It is subject to ignorance, to suffering, and to the dominion of death and is inclined toward sin. This inclination is called concupiscence. 80. How is the Good !ews spread? “Christ” in Greek, “Messiah” in Hebrew, means the “anointed one”. Jesus is the Christ because he is consecrated by God and anointed by the Holy Spirit for his redeeming mission. He is the Messiah awaited by Israel, sent into the world by the Father. Jesus accepted the title of Messiah but he made the meaning of the term clear: “come down from heaven” (John 3:13), crucified and then risen , he is the Suffering Servant “who gives his life as a ransom for the many” (Matthew 20:28). 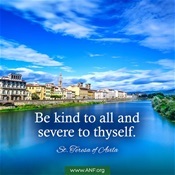 From the name Christ comes our name of Christian. All people form the unity of the human race by reason of the common origin which they have from God. God has made “from one ancestor all the nations of men” (Acts 17:26). 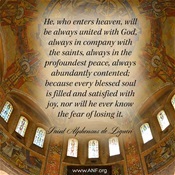 All have but one Saviour and are called to share in the eternal happiness of God. 69. How do the soul and body form a unity in the human being? The spiritual soul does not come from one’s parents but is created immediately by God and is immortal. It does not perish at the moment when it is separated from the body in death and it will be once again reunited with the body at the moment of the final resurrection. Man and woman have been created by God in equal dignity insofar as they are human persons. At the same time, they have been created in a reciprocal complementarity insofar as they are masculine and feminine. God has willed them one for the other to form a communion of persons. They are also called to transmit human life by forming in matrimony “one flesh” (Genesis 2:24). They are likewise called to subdue the earth as “stewards” of God. In creating man and woman God had given them a special participation in his own divine life in holiness and justice. In the plan of God they would not have had to suffer or die. Furthermore, a perfect harmony held sway within the human person, a harmony between creature and Creator, between man and woman, as well as between the first human couple and all of creation. Sin is present in human history. This reality of sin can be understood clearly only in the light of divine revelation and above all in the light of Christ the Saviour of all. Where sin abounded, he made grace to abound all the more. When tempted by the devil, the first man and woman allowed trust in their Creator to die in their hearts. In their disobedience they wished to become “like God” but without God and not in accordance with God (Genesis 3:5). Thus, Adam and Eve immediately lost for themselves and for all their descendants the original grace of holiness and justice. holiness and justice. It is a sin “contracted” by us not “committed”; it is a state of birth and not a personal act. Because of the original unity of all human beings, it is transmitted to the descendants of Adam “not by imitation, but by propagation”. This transmission remains a mystery which we cannot fully understand.